August 5, 2013 August 5, 2013 secondwindcsa2 Comments on Week 10 – Too much of a good thing? Week 10 – Too much of a good thing? 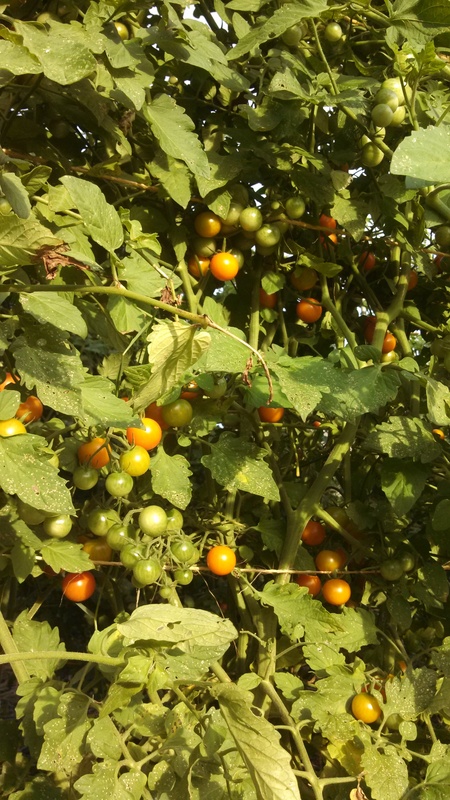 Sungold cherry tomatoes, waiting to be picked! Is it still summer? Every morning for the past week we’ve bundled up before starting the work day and felt the nip of evening’s chill before heading home in the evening! The farm has been responding as well – some things that would normally be in full swing by early August still seem slow to start. Much as we love tucking into a cozy warm bed on these cold evenings, as growers we know it keeps the tomatoes, peppers, and eggplants from ripening as quickly. This week we’ll be seeing the last of the salad mix/lettuce for a few weeks – it’s been a struggle to keep it going through summer (regardless of the recent chill! ), but there’s more on the way – probably arriving toward the end of the month. 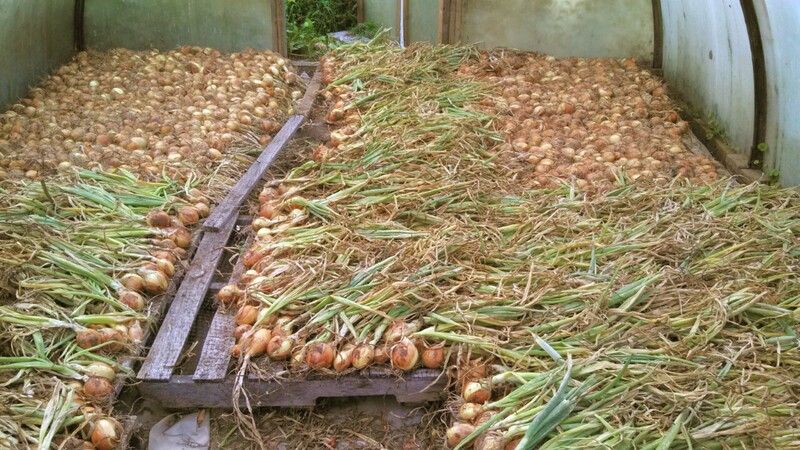 The first of the onions, curing in a hoophouse. You’ll also be receiving the second succession of beets this week – don’t forget the beet salad recipe we posted in week 5 (or just try steaming them and eating as a delicious, sweet side). You’ll also be seeing the first succession of fennel. We’ve included a couple recipes below to pique your culinary enthusiasm. Finally, just a quick reminder for when you come to pick-up: please make sure to check your name off in the sign-in sheet! We compare the number of members left to come against the amount of veggies out on the table (just in case), and it helps to have an accurate count. Thanks, and see you at distribution! 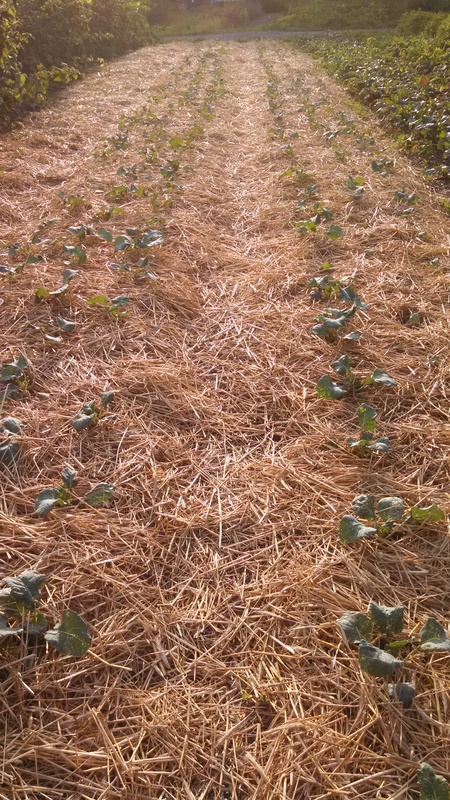 Fall broccoli, healthily growing up! In large skillet, sautee ginger in oil for one minute. Add fennel and sautee for five minutes (until translucent). Stir in jam and soy sauce, then add greens. Cook just long enough for greens to turn bright green and tender, then serve! Preheat oven to 350°F with rack in middle. Crush fennel seeds with a mortar and pestle or wrap in a kitchen towel and crush with bottom of a heavy skillet. Pat pork dry, then sprinkle with crushed fennel seeds and 1/2 teaspoon each of salt and pepper. Cut fennel bulbs lengthwise into 1/2-inch wedges. Heat oil in a 12-inch oven-proof heavy skillet over medium-high heat until it shimmers. Brown pork on all sides, about 6 minutes total, then transfer to a plate. Sauté garlic and fennel wedges in skillet until fennel is golden brown, about 6 minutes. Add wine, stirring and scraping up brown bits, then stir in broth and butter. Put pork on top of fennel and transfer skillet to oven. Roast until an instant-read thermometer inserted into center of pork registers 145 to 150°F, about 15 minutes. Transfer pork to a cutting board and let rest 10 minutes. I just enjoyed the fennel bulb from this week’s share sauted and poached with salmon (recipe: http://www.whfoods.com/genpage.php?tname=recipe&dbid=89). It was delicious. After reading about the challenging times over at Phillies Bridge Farm, just wanted to express my appreciation for all the work Bryn and Wes do to keep our CSA members fed in a healthy, sustainable, environmentally friendly and local fashion. Utah certainly does his part to keep a watchful eye on you and our crop fields. Great job, and very much appreciated!! YUMMMM! Tried this warm chicken recipe last night. EXCELLENT, EXCELLENT, EXCELLENT! Used everything (chard, beans, onion in lieu of shallot, and tomatoes) from CSA. It didn’t say, but as we were eating it decided that maybe the beans and the chard leafs should have been cut in half prior to putting them in the water.